Of all of the various drama genres in today’s television landscape, the quality family drama feels like the one most in danger of disappearing. Between shifting family viewing habits and the downward trend of television ratings for these types of programs, networks have all but abandoned the genre. Thankfully, ABC Family is there to give shows like Switched at Birth – which, in an earlier time, would have fit right in on network television on The WB – a home to call their own. 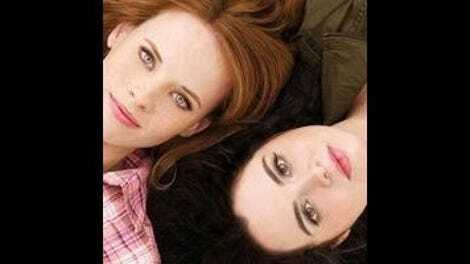 That Switched at Birth is a family drama is nice. That it turned out to be as surprisingly good as it was in its first summer season, well, that just has me very excited to get the chance to talk about it here each week. This excitement is why I was a bit disappointed this episode might potentially be some people’s introduction to the show. “Starry Night” does a lot of things very well, but one of its main setpieces being a teenager performing at a music festival doesn’t necessarily engender a lot of trust that the show is more than the typical teen trifle ABC Family usually airs. It’s not that the music festival storyline is bad, per se, but it does scream “silly teen drama right here!” in a way the rest of the show usually manages to avoid. It’s nice to see the show attempting to develop Toby as his own character, and Lucas Grabeel’s musical background obviously makes his Toby’s musical aspirations feel a bit more organic, but it’s frankly been done so many times on teen-focused television before that it’s hard to muster the necessary willingness to care. What the music festival does, however, is set up the perfect backdrop for some very successful character moments. The Daphne/Emmett/Bay triangle was introduced in the latter half of the summer season and although it had the potential to be disastrous, the show mostly managed to navigate it with ease. With Daphne declaring her intention to “fight” for Emmett in the summer season finale, this story is bound to be a big focus going forward. It’s comforting to see, then, that the story is about much more than two girls fighting over a guy. That’s part of it, sure, but it’s also about Daphne feeling isolated from her best friend; about how it’s stunting Daphne and Bay’s already strange relationship; and about how Bay and Emmett are both navigating their first relationship with someone who comes from an entirely different background and world view from their own. It would be easy to fall back on the simple teen drama of the love triangle and ignore the layers underneath, but Switched at Birth isn’t interested in simple. Most compelling of these layers is Bay and Emmett’s growing relationship and how their differences don’t define them, but do make things more complicated. Switched at Birth is never better than when it is exploring deaf culture, and their relationship is no exception. One of the show’s greatest strengths is how it not only respects every single character’s perspective but legitimately gives each character’s perspective a voice as well. Not only do we see the experience of Bay and Emmett navigating an impatient food vendor or angry concertgoer, we also get to have a conversation between the two which explains their different perspectives. It sounds a bit dull in explanation – show and then also tell often feels like a no-no in the world of television storytelling – but because of the unique aspect of Emmett’s deafness, the show-tell sequence really works. The only way Bay – or much of the audience – is going to understand is if he explains it; Bay’s tearful exclamation of “how am I supposed to know the rules?” applies to us, as well, so it’s nice to get the answers. One aspect of this episode quite different from anything in the summer series was the focus on Regina and Angelo. The story so far has definitely been more about Daphne getting to know the Kennish family, which meant Regina got a bit of short shrift when it comes to learning about her struggle with this new situation. Now that Angelo is in the picture full-time, the storytelling center appears to be shifting a bit towards Bay’s exploration with her birth parents. I mentioned earlier the show’s great ability to showcase every character’s unique perspective, and although Angelo isn’t the most compelling figure yet his backstory is interesting enough to promise a lot of future intrigue by having him as a part of the landscape. What’s most compelling so far is his immediate impact on Regina and what this means for her commitment to staying sober, which is already looking like a struggle. Regina drinking again isn’t necessarily interesting to me, but the threat of Regina drinking and how she deals with it most definitely is. How this evolves, and how Regina, Angelo, and Bay’s relationship develops, is something I am looking forward to greatly. If I have any concern going forward (aside from the silly music storyline) it is what’s happening with the lawsuit. Whether or not the hospital is held responsible for their mistake is honestly the least compelling dramatic element introduced thus far, although the show did get some wonderful mileage out of the reveal that Regina knew about the switch since the girls were toddlers. Once that little nugget was revealed, however, I don’t quite know why the story was continued. The conversation between Kathryn and the nurse (well played by Justina Machado) who is either their star witness or a lying bribe-acceptor who will send them all to jail was surprisingly nuanced and touching. Still, the lawsuit conjures images of courtrooms and depositions in the future, which isn’t the type of thing that draws me to Switched at Birth. What draws me are the characters, their journeys, and how they relate to each other. Kathryn’s conversation with the nurse and subsequent discussion with John prove that it can work. I just hope it continues to focus on the effect it has on the characters more than the mechanics. If you want to catch up, all previous ten episodes of the show are on Netflix Instant. Also, a note: I am not well-versed in deaf culture, so please let me know if I make horribly embarrassing or offensive mistakes. Google can only get me so far, I fear. Because Guitar Face doesn’t sound stupid? They’re obviously setting up Wilkie and Daphne for a relationship in the future, which seems agreeable. He’s somewhat charming in his goofiness. It’s unclear where Simone is heading, but I hope she has interactions with Daphne and/or Bay. Those ladies could use a girlfriend.